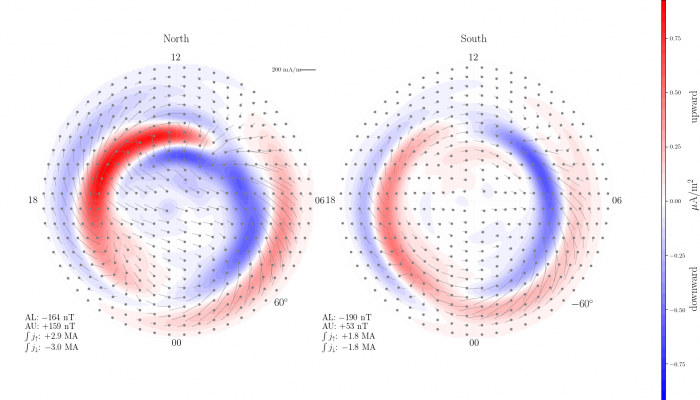 Recent research on the simultaneous displays of aurora in both hemispheres have lead to new knowledge of how large-scale asymmetries in the global magnetic field configuration can arise and be mitigated. This new understanding is contrary to what has been the consensus in the field, and was recently highlighted in a press release from the American Geophysical Union, followed by attention from numerous newspapers and magazines world wide. Along with the press release, the research group at the Birkeland Centre for Space Science prepared an animation of the processes leading to the longitudinal displacement of the aurora between the two hemispheres. This can be seen in the video below. A more in-depth explanation of the mechanism can be seen in the video below where PhD candidate Anders Ohma, lead author of the JGR paper highlighted in the AGU press release, explains the physics behind the longitudinal displacement of the aurora between the two hemispheres. 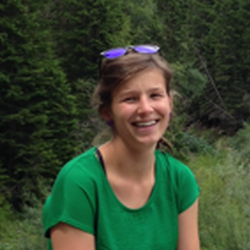 This months post is written by the ST Divisions Early Career Scientist representative, Theresa Rexer. 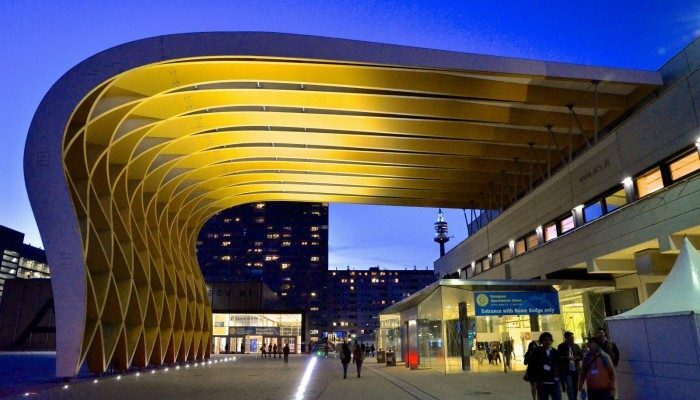 Are you ready for the EGU general assembly 2019? Got your abstract ready and submitted? No, what? Too early you say? No funds? As your Early Career Scientist Representative, let me tell you why now is the perfect time to start planning your trip to Vienna in April next year. Especially if you are an Early Career Scientist! At the general assembly (GA) more than half the participants are actually early career scientist which is defined as students at all stages or scientist who have finished their MSc or PhD within the past 7 years. Because of this, a large effort is made every year to make the meeting especially relevant for ECSs. There are numerous Short Courses that are specifically organised for ECSs. Want to know how others find their way around the huge conference site? Or how you can get the most out of you next poster or PICO presentations? The short courses are sessions or workshops that are complementary to the scientific talks at the GA , ranging from a host of general topics like visualising your research, how to navigate the GA or How to get your next job or research grant in academia that are relevant to all ECSs, to division specific topics where you can get an introduction to topics and technics specific to a field of research. In the Short course of the Solar-Terrestrial division, SC3.7/ST4.11: Meet the experts: The future of Solar terrestrial Research, you will get a unique chance to discuss the future challenges and opportunities with experienced and renown scientists in our field. You have heard of them. You might have read their papers. Now is your chance to talk to them and ask: What’s next for us? You can also meet your fellow ECSs, your future friends and colleagues, at one of the many social events like the Early career Scientists reception, the ECS forum meeting or in the ECS Lounge area, where free coffee and soft drinks are served and a series of pop-events for ECSs are held during the week. Still unsure and none of your colleagues are going? Consider signing up for the mentoring programme where ECSs are matched with a senior scientist to help you navigate the conference, network with other conference attendees, and exchange feedback and ideas on professional activities and your career development. Did you know that, as an ECS, you can apply for travel support? If you submit your abstract by December 1st 2018, you registration fee and travel expenses for up to 300 Euro could be covered for you. All you have to do is write and submit your abstract before December 1st and apply for the Early Career Scientist Travel Support. This is a great opportunity and December is closer than you think, so don’t wait. Submit your abstract, apply for support and get ready for next years best early career scientist conference. Not an ECS? The early bird still catches the bird….or the medal! The Vienna City Marathon (also includes a half-marathon and 10k runs) is held the weekend just before the GA and tickets are sold fast. You are correct in thinking that a number of your fellow ST division scientists and ECSs are participating, so join us! If you have any questions, suggestions, ideas or if you wish to join the Solar-Terresrial ECS Team, do not hesitate to contact me at ecs-st@egu.eu. Example of field aligned (red/blue) currents from both polar regions from the AMPS model. Grey pins represent the full horizontal current vector. The plot was made with the following input to the model: Solar Wind velocity: 350 km/s, IMF Bz: -8 nT, IMF By: -8 nT, dipole tilt angle: 20 degrees, F10.7: 80 sfu. In this month’s post, Karl Magnus Laundal explains a newly developed empirical model for the full high latitude current system of the Earth’s ionosphere, AMPS (Average Magnetic field and Polar Current System). The model is available and documented in python code, published under the acronym pyAMPS. The community is invited to download and explore the electric currents and magentic field disturbances described by the model. At about 10 times airline cruising altitude, at the boundary to space, the atmosphere is so thin that charged particles, electrons and ions, are not immediately neutralized in collisions. This inner edge of space, which extends from about 100 to 1000 km altitude, is called the ionosphere. In contrast to the neutral atmosphere, the charged particles feel the forces of electromagnetism. These forces depend strongly on the interaction between the solar wind and the Earth’s magnetic field, which happens much further out, at about 10 Earth radii (roughly twice as distant as geostationary satellites, but well inside lunar orbit). The result of this interaction is communicated to the upper atmosphere along magnetic field lines, and as a result, a 3-dimensional current system is generated in the ionosphere. This current system can change very rapidly, partly because of changes in the solar wind and in the interplanetary magnetic field. The AMPS model describes the average ionospheric magnetic field and current system for a given solar wind speed, interplanetary magnetic field vector, orientation of the Earth’s magnetic dipole axis, and the value of a solar flux index (F10.7). The model is empirical, which means that it is derived from measurements. We use measurements of the magnetic field, from the CHAMP and Swarm satellites, in low Earth orbit. For each measurement, model estimates of Earth’s own magnetic field, and the magnetic field associated with large-scale magnetospheric currents, have been subtracted. The remaining magnetic field is assumed to be related to ionospheric currents. Millions of measured magnetic field vectors are used to fit several thousand unknown parameters in an intricate mathematical function that describes the ionospheric magnetic field at any point in time and space. Electric currents are calculated from the magnetic field. Model values of AMPS magnetic fields and currents can be calculated with the Python library pyAMPS, which is located here: https://github.com/klaundal/pyAMPS (documentation here: http://pyamps.readthedocs.io/). This is not the first empirical model of ionospheric currents and magnetic fields, but there are a couple of important characteristics that sets the AMPS model apart from others: First, we have corrected for variations in Earth’s own magnetic field, which strongly distorts the ionospheric currents. This allows us to make precise comparisons between hemispheres. We have not imposed any symmetries between hemispheres; for example seasonal variations are not necessarily the same in the north and south in the AMPS model. Finally, this is the first empirical model to describe the full ionospheric current system, and not only the field-aligned part or the parts which circulates horizontally. This allows us to calculate full horizontal ionospheric current vectors without any assumptions about conductivity. These unique features are made possible by the dataset provided by the CHAMP and Swarm missions, of very accurate magnetic field measurements from low orbit. The CHAMP satellite reentered Earth’s atmosphere in 2010, after 10 years of operation. In 2013, ESA’s Swarm satellites were launched, three satellites that carry even more precise magnetometers than CHAMP. So far, two of the Swarm satellites have flown side-by-side, near 450 km altitude, while the third satellite is a little higher. Swarm is expected to stay in space for many years, and we plan to release updated versions of the AMPS model as the data set grows. The production and publication of the AMPS model is supported by ESA through Swarm DISC. Last week the 2018 General Assembly were held in Vienna. Gathering 15 075 scientists from 106 countries, this is the most important EGU event throughout the year. Summarizing what happened during the week is an impossible task, as a meeting like this is way more than the 666 individual sessions convened and the 11 128 posters presented during the week. However, in this post I will point to some of the ST Division specific highlights. This year, spring came to Vienna together with EGU. Many of us therefore used this excellent opportunity to stay outside in the sun to relax or explore the beautiful medieval city, in between the busy meeting schedule. However, the main activities happened inside the Austria Center Vienna. During the Solar-Terrestrial Division meeting, Theresa Rexer was announced as the new Early Career Scientist (ECS) representative in the division, taking over from Jone Peter Reistad. She will continue the ongoing efforts to make the General Assembly even more relevant for students and researchers in the early stages of their career. During the General Assembly, the Solar-Terrestrial ECS team held the session “Meet the Experts: The Future of Solar Terrestrial Research”, for the fourth year in a row. The session was very well attended (78 participants) and the invited speakers did an excellent job in reviewing important challenges and topics relevant for ECS to embark upon in the near future, covering topics from the Sun to the magnetosphere, ionosphere, and its coupling with the atmosphere. This year we had three medal awardees in the ST division. Ilya Usoskin received on the Monday the Julius Bartels medal for his “key contributions to long-term changes of cosmic rays and solar activity, qualifying him as a founder of the space climate discipline”. The next day Eckart Marsch received the Hannes Alfvén medal for “fundamental contributions to our understanding of the kinetic processes and plasma turbulence in the heliosphere, as well as for work that helped HELIOS become a successful mission and initiated the Solar Orbiter.” Finally, Natasha L. S. Jeffrey received the Division Outstanding Early Career Scientist Award for “her outstanding achievements in improving the standard model of fast electrons produced in solar flares, thereby eliminating the long-standing low-energy cut-off uncertainty.” (citations are from https://www.egu.eu/awards-medals/). In the Solar-Terrestrial Division, a total number of 34 session were held, making up a varied program within most of the disciplines of our division due to all the contributions and efforts from the community. I can only say that I look very much forward to the meeting in Vienna next year! Social media platforms offer every person with internet access the possibility to share content of various kind. The recent increase in social media use globally give birth to new tools and insights, from a different perspective. The size of, and the global nature of the user driven social media, makes one expect it to include information also about geomagnetic activity related to posts of visual observations of the aurora by the users. 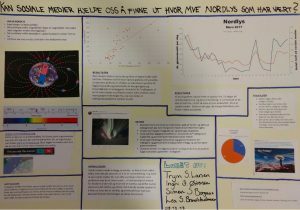 Inspired by the ongoing Aurorasaurus initiative, an outreach project with a High School class in Norway was undertaken, where the students were given the task to see if they could find any connection between the number of social media reports of aurora (using Twitter), and the observed level of geomagnetic activity (using the AL index). Their results showed a highly significant correlation, especially during the months of high geomagnetic activity, as seen in the above plot. We here include a short project report from one of the groups to share details on how the investigation was done. The text has been prepared by Simen Sande Bergaas, Lea Sommersten Brandstadmoen, Trym Svardal Larsen, and Ingri Østensen from Langhaugen High School, Norway, together with two of their teachers. We wanted to find out whether social media could be a valid source for finding out how much northern light there had been, and when it appeared. We used Twitter as our social media, and searched on one specific date, so we could see how much northern light there had been each day. 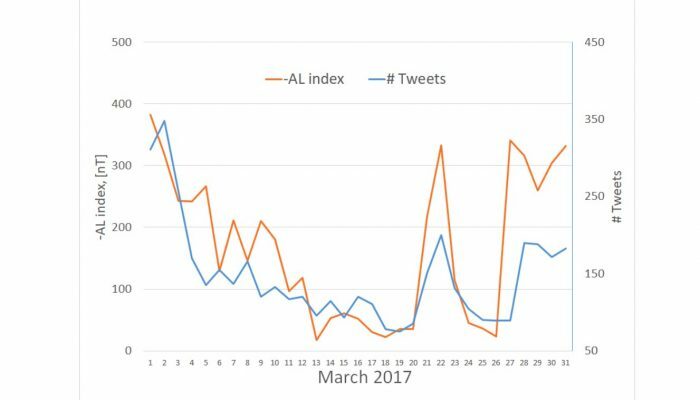 We wanted to see if there were any similarities between a geomagnetic activity index (AL) and the number of hits we got on Twitter. We plotted these results together with the daily average geomagnetic index (AL) using Excel. As we can see from the top figure, we got a good match between the daily Twitter count and the AL index. We got similar results for most of the eight months. The only month that we did not see any correlation was December, in which had very low Twitter counts. How many of the Tweets were relevant? One of the groups wanted to do something more with the project, and decided to count how many of the posts we found were relevant, and actually showed northern lights that had occurred that day. We chose one of the days, and then we counted. The result is shown in the figure below. ￼The day we counted, there were 96 posts. Out of these 96 posts, 22 did not contain relevant information to our project. That equals 23% non-relevant posts, and 77% relevant posts. 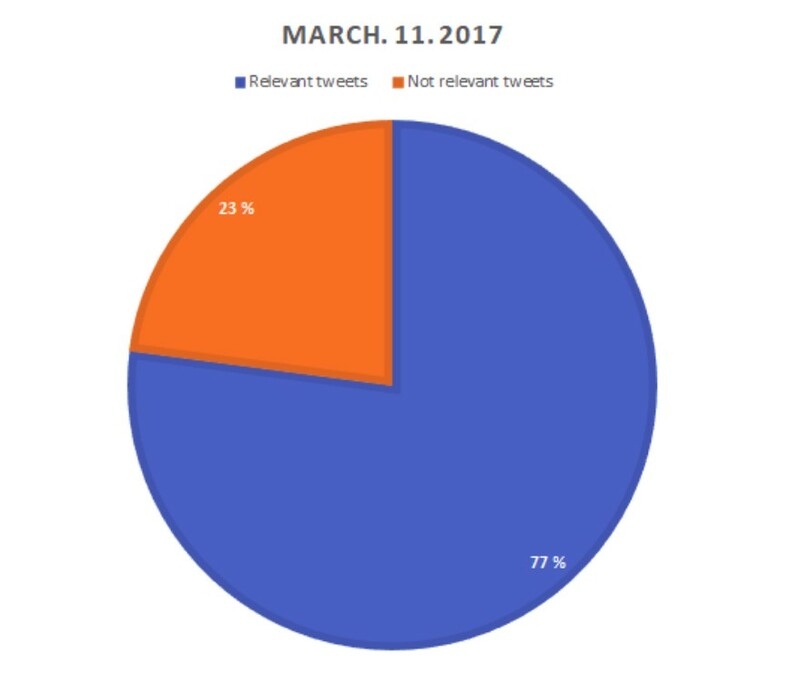 Breakdown of all Twitter posts on March 11, 2017. Most of the posts (77%) were found to be related to auroral activity. What we saw from these statistics was that there are similarities between the measurements and the Twitter posts. We can say that social media can be a somewhat valid source for describing the geomagnetic activity level, but not a waterproof one. Looking at the other months, it looks like the correlation improves during active times, while December, which was a quiet month, had very poor correlation. We also see that on March 11, very few of the posts were non-relevant, which strengthens the credibility of social media as a source. 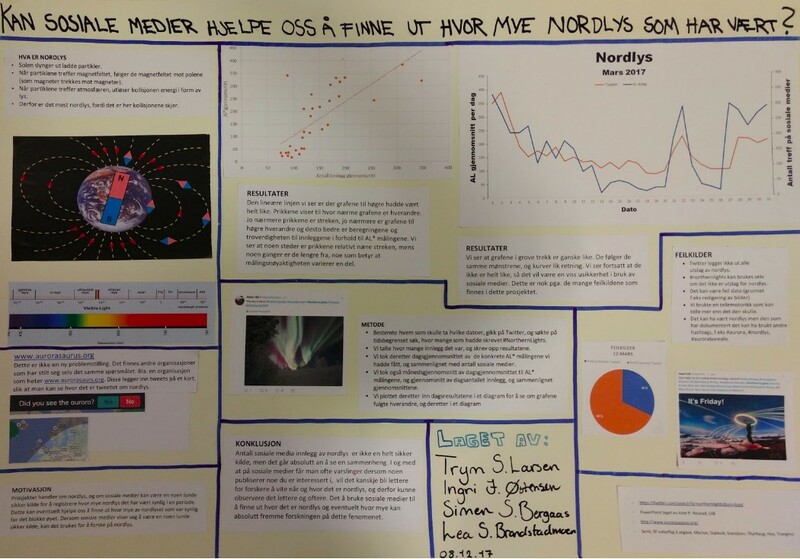 The students presented their work on posters to the Birkeland Centre for Space Sciance at the University of Bergen, Norway. How do we study the magnetosphere? Our closest star, the Sun, is constantly emitting hot gas in all directions as its upper atmosphere, the corona, expands. This is known as the Solar Wind, also carrying with it an embedded magnetic field, the Interplanetary Magnetic Field (IMF). The IMF originates at the Sun and forms an enormous spiral throughout the solar system as the solar wind escapes radially, while the magnetic field-lines are anchored to the rotating Sun. This is the large-scale environment, or the laboratory, for a magnetospheric physicist. The core of magnetospheric physics is to increase our understanding of the complex interactions occurring when a magnetized planet is exposed to this solar wind and IMF environment. This blog-post will briefly mention some of the ways we study this interaction, and what kind of questions we try to answer about the solar wind – magnetosphere system. First of all, what is a magnetosphere? A magnetosphere is the region around a magnetized planet where the magnetic field is the one related to the planet itself. The other magnetic domain is the one only connected to the Sun or solar wind, referred to as the IMF in this context. As for the Earth, the boundary between the Earth’s magnetic field and the IMF field-lines is rather sharp. On the dayside, this boundary, known as the magnetopause, usually sits at about ~10 Earth radii toward the Sun at the subsolar location, and wrap around to form a blunt surface that define the magnetosphere, as seen in the image above, forming a long tail in the anti-sunward direction. When the solar wind and the IMF interact with the magnetosphere a variety of processes take place. Most interesting – when it comes to energy and momentum transfer into the magnetosphere system – is the magnetic interactions, initially taking place at the dayside magnetopause. 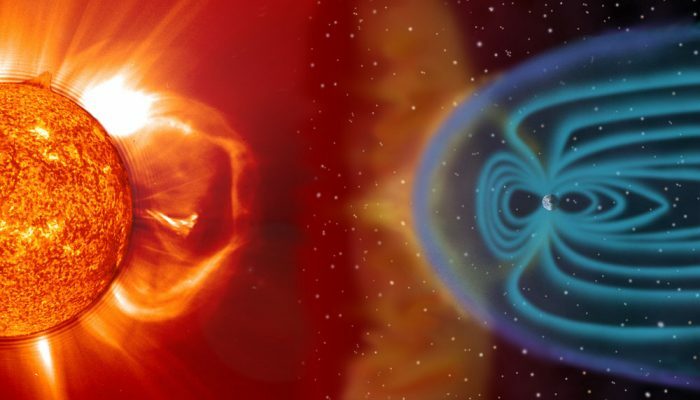 Through a process known as magnetic reconnection, field-lines initially connected only to the planet can merge with the incoming IMF to form field-lines magnetically coupled both to the planet and to the Sun/solar wind. This allows these newly opened field-lines to be pulled tailward by the solar wind, while still being anchored to the Earth. This is how most of the solar wind energy enter the magnetosphere system, which could reach values of Terra Watts during geomagnetic storms. A consequence of the dayside reconnection process is that the reservoir of field-lines connected only to Earth is continually reduced. The magnetosphere’s way of solving this problem is through creating new field-lines that have both their footprints anchored to the planet, again through the process of magnetic reconnection. This happens deep within the magnetotail, and causes momentum and energy to be transported toward the planet, responsible for a variety of phenomenon that we can see and measure on the ground at Earth. Most notable are the aurora borealis and -australis visible in bands around the magnetic poles, and associated magnetic disturbances. Interestingly, the entry of the solar wind plasma (particles) itself into the magnetosphere is not very important in describing the aurora. The accelerated particles causing the aurora largely originate from within the system although their energy come from the solar wind. 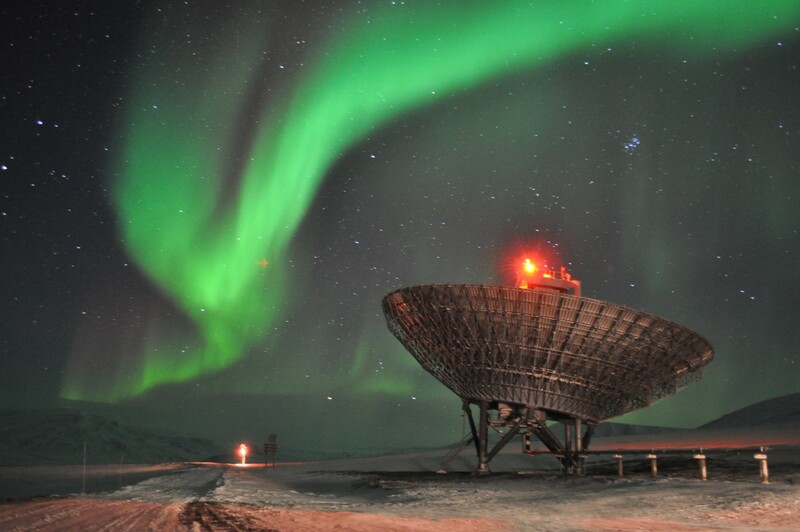 Nighside aurora seen from the EISCAT Svalbard radar site. Credit: Jone Peter Reistad. 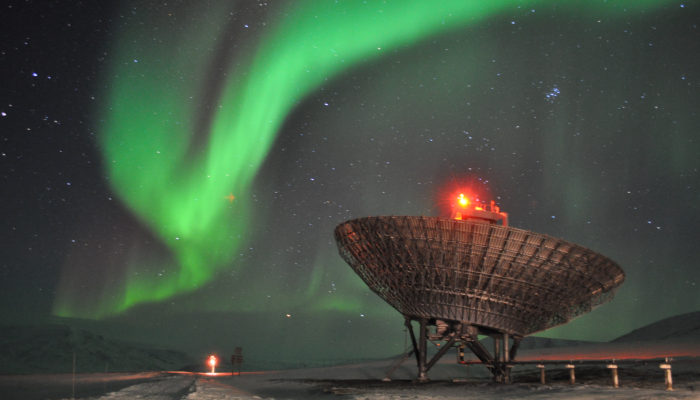 When studying the magnetosphere, a large variety of instruments are being used. One can distinguish between two types of measurements that complement each other, to a large degree. To measure the influence from a large region of the mangetosphere simultaneously, remote sensing techniques are applied. One example of such is observations of the aurora, where the light originate from the high latitude ionosphere at typically 100-200 km. Since the magnetic field at high latitudes map out to very large regions of the magnetosphere, the aurora can be interpreted, to some extent , as a screen illuminating the more distant magnetospheric processes. Therefore, by studying the high-latitude electrodynamics close to the ground, one can infer properties of the much larger magnetosphere. The other type of measurements is in-situ observations of physical quantities such as electric and magnetic fields/waves and charged or neutral particles. This is usually obtained from satellites orbiting within the magnetosphere. One major challenge when interpreting such data in terms of the big system is that they only provide point measurements in a huge system. Also, temporal and spatial variations are in general mixed, as stationary is difficult to obtain/determine. Hence, remote-sensing and in-situ measurements addresses different spatial scales and often different processes in the magnetosphere system, and act complementary to each other in order to obtain increased knowledge of how the system works. Recent missions that has greatly contributed to increase the understanding of the solar wind – magnetosphere – ionosphere interactions include Cluster, THEMIS, Swarm, Van-Allen Probes, and MMS. Although we have learned a lot, especially through the space age, of how the solar wind and IMF environment affect the mangetosphere, many questions still remain. One example is the very nature of the reconnection process, which is a fundamental plasma process allowing efficient energy transfer into the system. A dedicated mission, the Mangetospheric Multiscale Mission was recently launched to investigate its details by probing the reconnection region at finer spatial scales than ever before by 4 closely separated spacecrafts. At present, most models describing the large-scale distributions of the important parameters in our system are indeed very static. We know that the reality is highly dynamic and structured, and it remains as an outstanding challenge to further enhance our understanding of the complexities in our system to be able to more accurately predict the outcome of the solar wind – magnetosphere – ionosphere interactions. Are you a student, or have obtained a MSc or PhD degree within the past 7 years? If yes, you are an Early Career Scientist! In the EGU we take great care of the young scientists, and offer a wide range of opportunities, mostly associated with the General Assembly. My name is Jone Peter Reistad and I am the Early Career Scientist (ECS) representative in the Solar-Terrestrial division. My role is to make the ECS aware of the opportunities and activities that EGU offers to the scientists of the future, as well as engaging in creating and shaping the ECS venue. The purpose of this blog-post is to draw your attention to the upcoming General Assembly in April next year. This might sound distant, but you should definitely start thinking about this now! Let me explain why: first of all, the EGU General Assembly is a special meeting for ECSs. Actually, more than 50 % of the meeting participants are covered by the ECS definition. During the last years there has been an increasing effort to make the General Assembly more relevant for ECS. There are numerous Short Courses addressing practical skills (both general and more division specific), hot topics, and other challenges that ECS face. Furthermore, social events such as the icebreaker reception, a networking reception, and the ECS forum, are held during the week. For these reasons, the EGU General Assembly is a highly relevant, and in my opinion outstanding meeting for Early Career Scientists to attend. But why consider going to EGU now? The regular abstract deadline is January 10, however, if you send in your abstract by December 1st, you can apply for Early Career Scientist’s Travel Support. This will potentially cover your registration and abstract fee in addition to travel expenses up to €300. December 1st is only a few weeks ahead, so do not hesitate to submit your abstract and apply for travel funds. Of special relevance to our Solar-Terrestrial ECS readers is a Short Course we will run now for the fourth time: “Meet the Experts: The future of Solar-Terrestrial research”. Being an Early Career Scientist, it is often hard to identify which questions are new and what has been answered before. In this short course we invite a panel of renowned researchers. They will give their view on how far we have come in our understanding, and most importantly, on what challenges lie ahead for the young scientists to embark upon. This is an excellent opportunity to meet with the experts and discuss the future of our community. We are currently a team of 5 people involved in making the Solar-Terrestrial division, especially the General Assembly, more relevant for ECS. If you have any ideas to what could be done, or want to contribute in any way, please send me a notice to ecs-st@egu.eu.